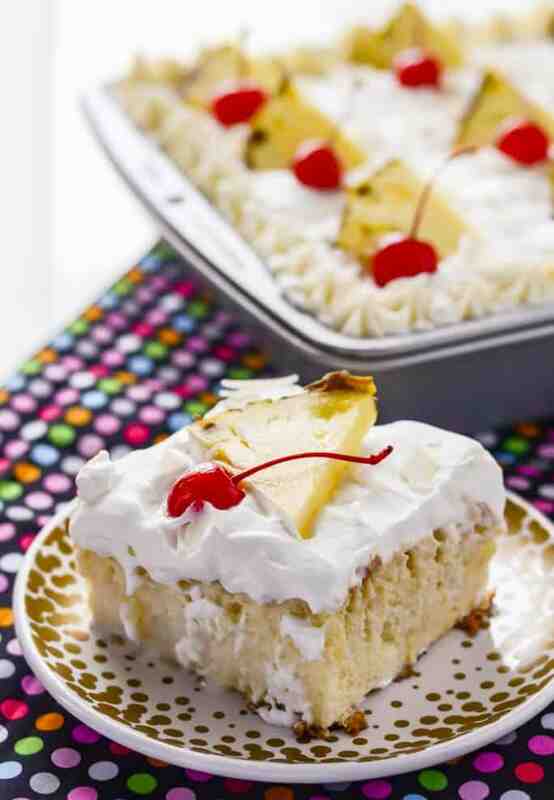 You can have your cake and drink it too with this luscious Pina Colada Tres Leches Cake! Adding the flavors of a favorite fruity summer cocktail puts an even more tropical twist on an already delicious Hispanic dessert! It’s Friday. It’s summer (well, almost). The sun is out and the world is still spinning. Let’s put aside any sadness or stress we might be feeling and eat some cake, shall we? This Pina Colada Tres Leches Cake is life changing. Pretty please tell me you’ve had the perfection that is tres leches cake?? 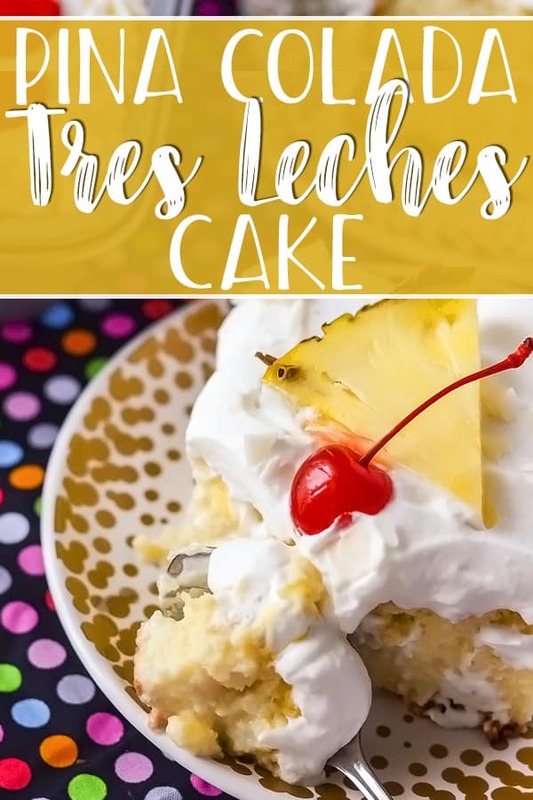 Otherwise known as three milk cake (or pastel de tres leches en Español), the tres leches cake originates from Latin America. 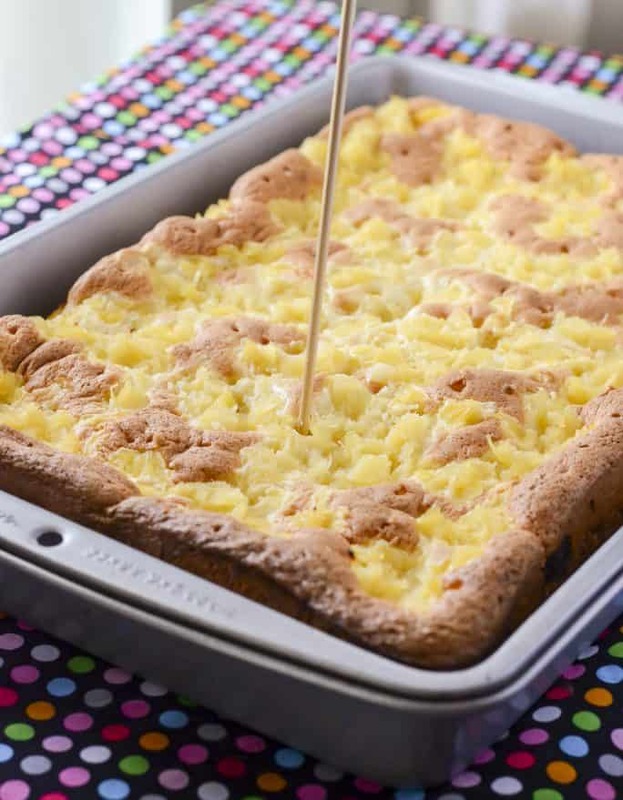 It consists of a light, spongy cake liberally soaked with different milks to give it a super moist and tender texture. The hatred I’ve seen directed at dessert knows no bounds. Then there are others (like me) who feel it’s a treat straight from heaven itself. 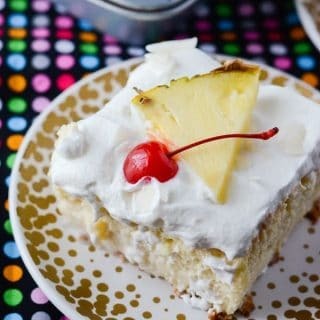 This particular tres leches cake recipe is a bit different in that it’s a riff on a Piña Colada cocktail. 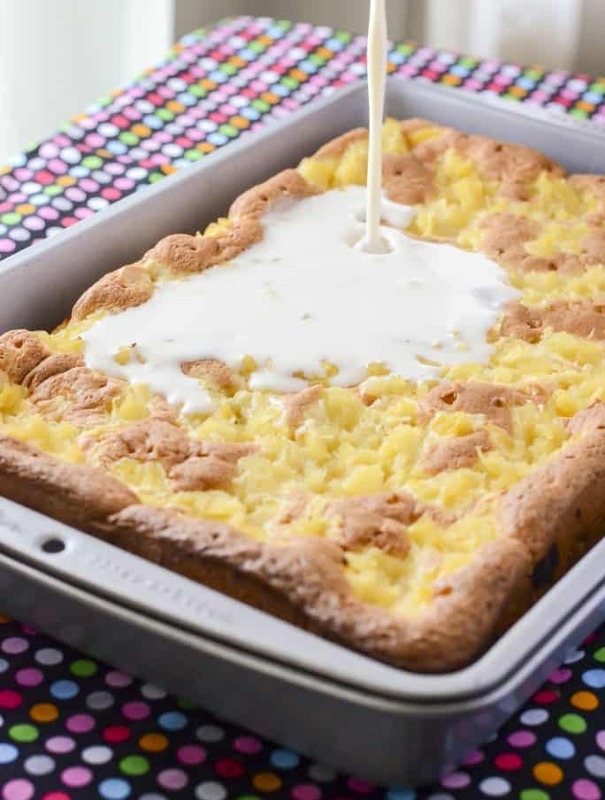 The sponge cake is infused with crushed pineapple and it’s juices, and the soaking leches replace the whole milk with coconut milk. And of course, there’s rum. In all three parts of this cake actually. You could even soak your pineapple wedge garnishes in rum, if you’re feeling particularly festive. 1. Preheat your oven to 350 degrees F. Grease a 9×13-inch baking pan and have it handy. 2. Combine your dry ingredients in a bowl and whisk them together. 3. Beat egg yolks and sugar on medium high speed until thick and pale yellow. Stir in pineapple juice, vanilla and rum, then fold in the dry ingredients. 4. In a separate bowl, beat egg whites and cream of tartar until soft peaks form. Very gently fold the egg whites into the batter in 3 additions – don’t worry if there are a few white streaks. Fold in half of the crushed pineapple. 5. 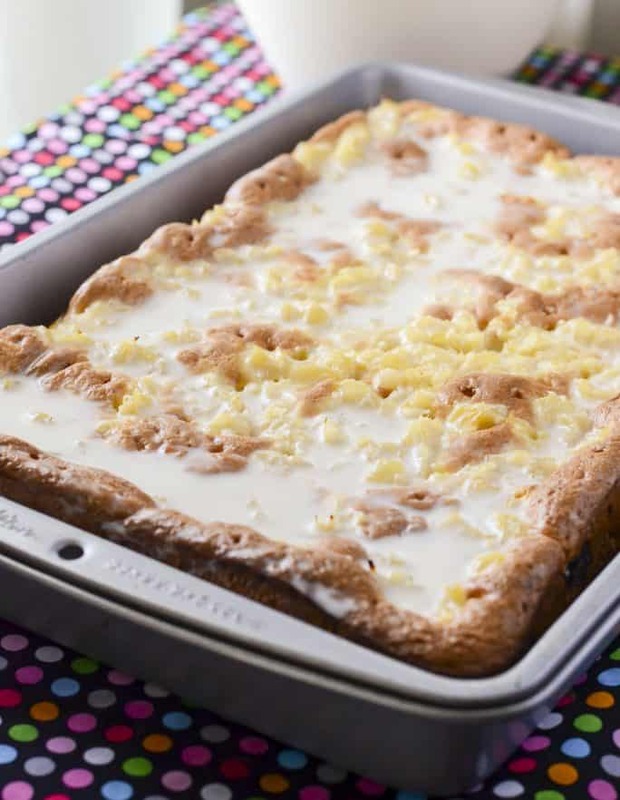 Pour the batter into the baking pan and spread the remaining pineapple on top of the batter. 6. Bake for 30 minutes and let cool completely. 7. Whisk milks, vanilla and rum together in a bowl. Poke holes in the cooled cake using a skewer or fork, reaching down to the bottom. Pour the milk mixture over the cake, being sure to soak the whole top. Cover and chill in the refrigerator for 3-24 hours. 8. 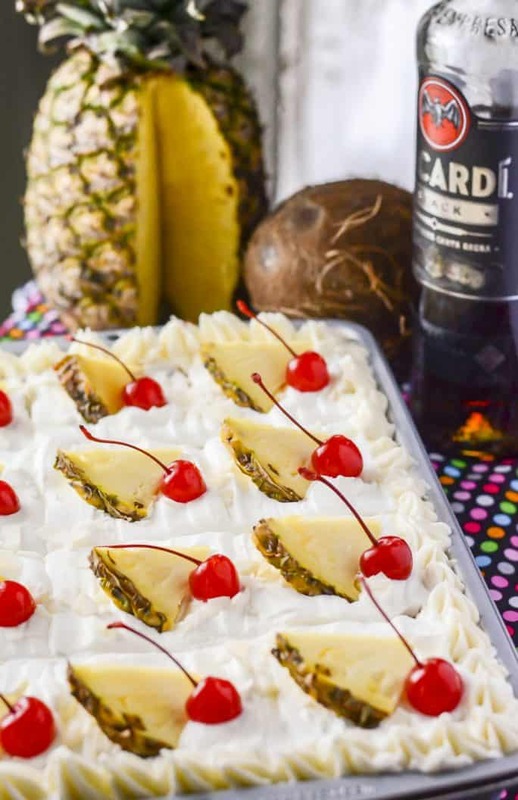 Top with whipped cream and garnish with pineapple slices, maraschino cherries, and coconut chips. This might be the best tres leches cake ever! Coconut tres leches is my absolute favorite version of this classic Hispanic dessert. Abe brought home a couple of pieces from work a few years ago, which was when my obsession began. Throwing pineapple into the mix just made sense. Enjoying this three milk cake is an experience. While it’s both rich and sweet, it’s also very light and so easy to eat on a hot summer day. 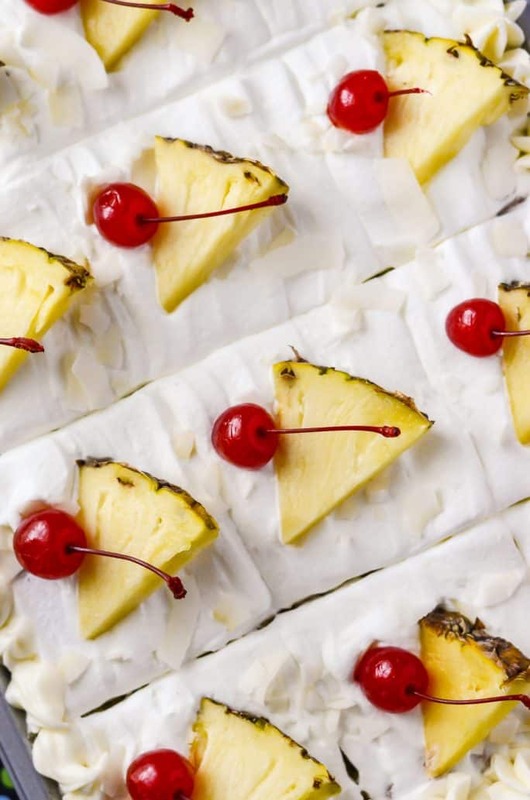 Plus, the tropical flavors make it the perfect addition to any picnic, party, or barbecue. And of course – don’t forget Cinco de Mayo! 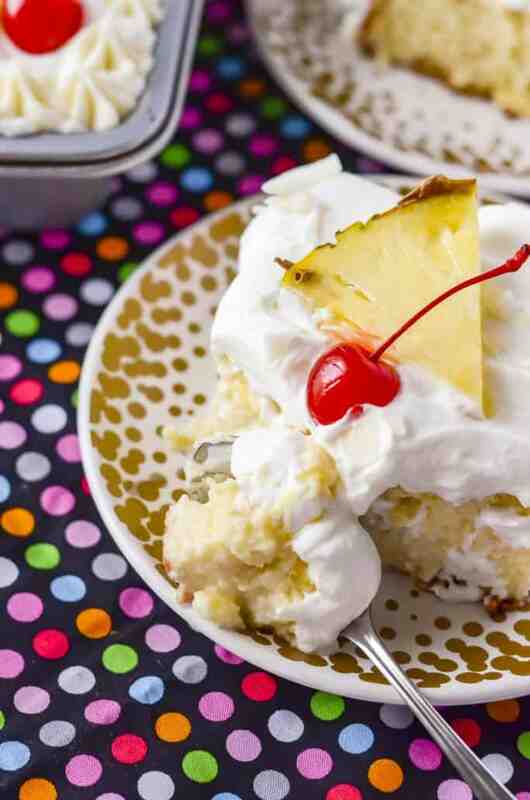 If you’re not a fan of pineapple, leave it out and make a standard coconut tres leches recipe! Just replace the pineapple juice in the recipe with an equal amount of coconut milk. Mix up your milks! In a standard tres leches mixture, equal parts of evaporated, sweetened condensed, and whole milks are used. Sub out the whole milk for 1%, coconut milk, almond milk, or half and half. You could even try eggnog! The recipe CAN be made with cake mix – just be sure to pick a white mix versus butter or yellow. And don’t skip folding the egg whites in, as that is what makes this cake so light and fluffy. Let the cake soak for as long as possible. Leaving it overnight in the fridge allows plenty of time for the cake to really take in all the moisture. Don’t like your cake too moist? Feel free to adjust the amount of liquid depending on your tastes. If you prefer more texture to your tres leches cake, cut back the amount of milks you pour over the cake to half or 3/4 of the what this recipe calls for. Love all thing Pina Colada? Try one of these other tasty treats! Preheat oven to 350 degrees F. Generously grease a 9x13-inch baking pan and set aside. Combine the flour, baking powder, baking soda, and salt in a bowl and whisk together. Set aside. In the bowl of a stand mixer fitted with a whisk attachment, or using a hand mixer, beat the egg yolks and sugar on medium high speed about 5 minutes, until thick and pale yellow. Stir the pineapple juice, vanilla and rum in on low speed. Add the flour mixture and gently fold in. In a clean mixing bowl, beat the egg whites and cream of tartar on medium high speed until soft peaks form. Very gently fold the egg whites into the batter in 3 additions - don't worry if there are a few white streaks. Stir in half of the crushed pineapple. Pour the batter into the prepared baking pan. Spread the remaining pineapple on top of the batter. Bake until the cake is golden and the center bounces back when touched gently, about 30 minutes. Let cool completely. In a medium bowl, combine the milks, vanilla and rum, whisking to combine. Use a skewer or fork to poke holes in the cake, reaching down to the bottom. Pour the milk mixture over the cake, being sure to soak the whole top. Cover and chill in the refrigerator for at least 3 hours, or overnight. Combine the heavy cream, sugar, vanilla and coconut extracts, and rum in the bowl of a stand mixer fitted with a whisk attachment. Whip until cream reaches soft-medium peaks. With a rubber spatula, spread the whipped cream over the top of the cake. Top with coconut chips, slices of pineapple and maraschino cherries. Covered cake will keep in the fridge for up to 5 days. 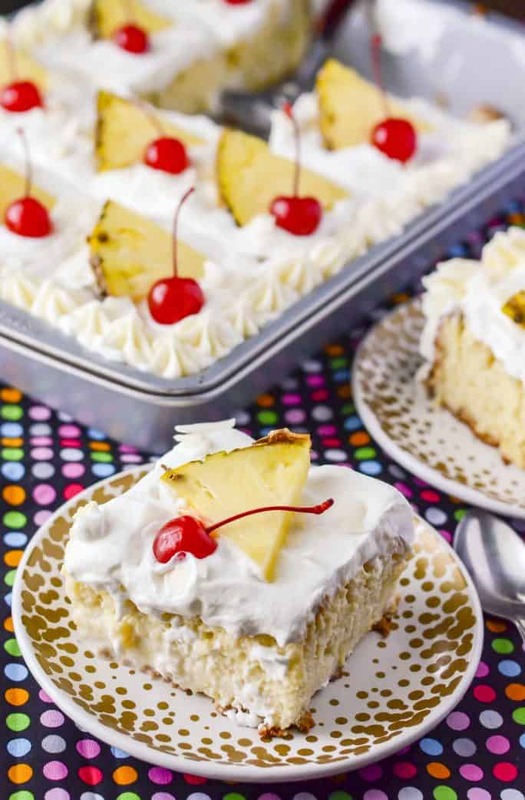 PIN THIS PINA COLADA TRES LECHES CAKE RECIPE FOR LATER! This recipe was originally published on July 10, 2015. It was edited, rewritten, and republished on June 8, 2018. Lots of recipes including fresh fruits! This cake looks absolutely amazing! Pineapple is my favorte, so any pineapple dessert is almost guaranteed to be something I’ll enjoy. Gonna have to try this one out before summer is over. I would like to see more cupcakes with fillings please. I’d like to see more dessert recipes. I love easy to make recipes with ingredients you have on hand or are easy to find in the grocery store and not too expensive. Especially at this time of year love things I can take to a picnic or camping or that will work for potlucks in the winter time. I like easy stuff that’s healthy and filling. I would like to see recipes about mini versions of food: mac’n’cheese cups, lasagna cups, peach cobbler cups,etc. I would love to see a recipes for healthy meals that are quick and easy to make. I’d love to see gluten free subs or options. This recipe looks delicious! My hubby is from El Salvador so I would love to see more traditional Latin desserts! Oh my!! This looks, sounds and seems like it is just the very definition of decadent….yum yummy! My husband is from Mexico amd today is his birthday. As usual, he requested a tres leches cake. I was looking for something different and came across this. The sponge just came out of the oven and it’s perfect! My usual problem is the sponge is too dense, I can tell that this one isn’t. Can’t wait for it to cool so I can start the next steps! I love that you made my favorite drink into a dessert! I can’t wait to try this cake! Have mercy!!! This takes Tres Leches to a whole new level! So perfect for summer grilling menus – definitely bookmarking for later! !